The state that produced one of the nation’s most infamous late-term abortionists now has one of its strongest pro-life laws. When Philadelphia police and federal agents raided Kermit Gosnell’s abortion facility on suspicion of drug trafficking, they weren’t ready for what they found. Bags and bottles of fetal body parts, strewn throughout the building. Shelves lined with jars of severed feet. Cat excrement on the stairs, and the odor of feline urine everywhere. Unsterilized instruments. Disposable medical supplies, used repeatedly. “Semi-conscious women waiting for abortions moaning in the waiting room or the recovery room, where they sat on dirty recliners covered with blood-stained blankets,” according to a nearly 300-page grand jury report. They’d all been sedated by unlicensed staff who couldn’t say what medications or dosages had been given. Gosnell, known on the street as the man to see for illegal, late-term abortions, routinely delivered live babies and killed them by what he called “snipping”-—cutting their necks with scissors, severing their spinal cords. He trained staffers to falsify ultrasound exams to make the baby look smaller. He had no trained nurses or medical personnel on staff; his anesthesiologist was a teenager. Hundreds of babies likely died by “snipping” during Gosnell’s three decades at the clinic, prosecutors said. He was charged with eight counts of murder-—seven babies and one woman who died of an overdose of painkillers. But there’s another story that’s drawn less attention. It’s the story of how Gosnell got away with his crimes for so long, thanks to the willful neglect of state officials appeasing “pro-choice” politicians. 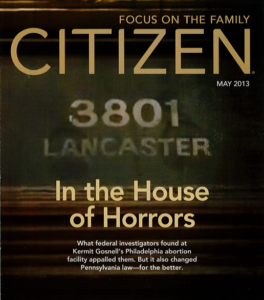 It’s also the story of what’s happened since those crimes were exposed-—and of the people, both inside and outside Pennsylvania government, who fought to keep it from happening again. To learn more about the Gosnell case, visit http://3801lancaster.com.